Day Seventy One. Wow! Ten whole weeks of cooking new recipes. And today I've found one that the husband approves of. 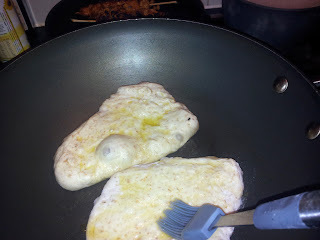 At the risk of further 'sleb stalking/over-promotion, thank you Dan Lepard for saving the day with your frying pan naan. I blogged about the naan issue two weeks ago when I tried the recipe from my Breads of the World book. Long story short, Sainsburys stopped selling Sharwoods Naan Mix and since then I've struggled to find a replacement. Even Waitrose's finest fresh garlic and coriander naan didn't cut the mustard. To the point where on Friday, the husband announced he was never eating Chicken Bhuna or Chicken Tikka at home again. Given that he exists on a rotation of roughly nine evening meals, this was nearly too much for me to take. So with a lot of pleading, I promised that Dan Lepard would save the day. Trouble is, if the hubby thought it took a long time to make the Sharwoods ones, these take even longer. But they are SO worth it. They're not complicated, it's just that they have to sit around for ages proving. And a word of note. Mr Lepard mentions that you have a choice of making four or six from the dough. I advise you to make six. I chose to make four and they were e-NOR-mous. So we ate one each and two are going into the freezer for next weekend - apparently they freeze really well so my fingers are crossed. Zero perspective - they were HUGE! Cooking them in a hot, dry wok rather than under the grill like most other recipes meant they puffed up beautifully and had a lovely, scalded bottom but were kept soft on top by the garlic infused olive oil. Pictures aren't brilliant as they're only from the phone, but no picture could do these justice - not even the one in the book! Am now on a mission to find the perfect saag aloo recipe. The husband refuses to eat anything other than Sharwoods from a microwavable packet (anyone who knows him won't be surprised) but having found a great tikka recipe, a great chutney recipe (although when peaches are in season, I'll be looking for more chutney recipes) and a great naan recipe, the saag on my plate tonight was the only thing not home-made. So that'll be next Sunday's recipe sorted then! Mix the yogurt, milk and water in a bowl. Add the yeast, salt and sugar and mix until combined. Mix in the flours to form a soft dough. Cover and leave to rise for 30 mins. Lightly knead once, return to the bowl and leave to rise for 1 hour. Turn out onto a floured board. Shape into a circle and cut into four or six pieces. Roll each piece into a triangle about 1cm deep. Heat a large frying pan or wok over a moderate heat. Place the naan into the pan, stretching slightly and brush with the garlic oil. 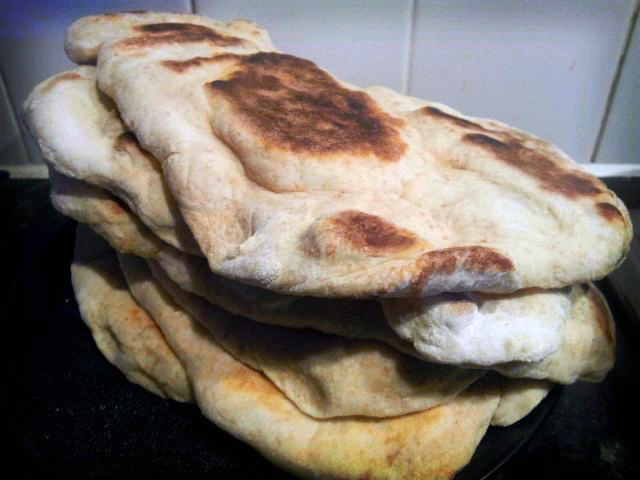 Cook until the bottom has browned and the naan has puffed up. Update: These freeze really well. I just pop them out of the freezer, butter them and pop them into a warm oven (about 150 fan) for ten minutes.